Struggling with physical discomfort caused by osteoporosis is just one half of the story. But what about the emotional stress that a person goes through because of osteoporosis? The question is worth contemplating and definitely requires a probe into the psychological state of an osteoporosis patient. An osteoporosis patient lives under the constant fear of being highly susceptible to bone fractures. This nagging feeling can get so strong that it may even stop the person from finishing everyday chores. Inability to stay active like before could lead to depression. Accepting the fact that they cannot move as swiftly as before or balance well on their own could prove difficult to accept. Feelings of self-accusation could considerably increase too. People tend to isolate themselves because of their increased dependency on family members and friends. Osteoporosis affects the external appearance adversely. Sometimes, limbs tip towards becoming curved and deformed if the condition worsens. This snatches away an individual’s self-confidence to a great extent. 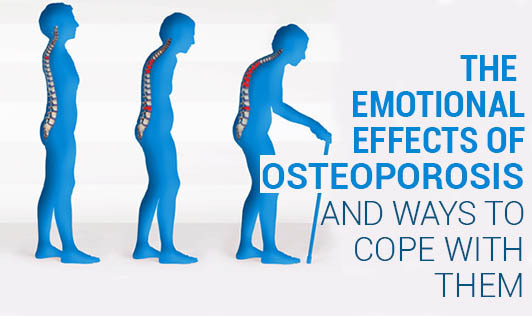 Imperfections caused by osteoporosis are known as Osteogenesis imperfecta which cause various other problems such as hearing loss, urinary incontinence, hernia, and damaged teeth. All of these make social life rather difficult for the patient, drifting them closer to the fear of social rejection and subsequent isolation. Concerns related to the future and old age can sadden the patient miserably. They could be constantly tormented by thoughts of how they will sail through old age and this can lead to depression too. Joining a community or a support group: Knowing and meeting people who are on the same track and hearing in on their stories can help adopt a better approach. Cultivating optimism and a positive outlook: Finding out ways to keep going instead of allowing negative thoughts to plague the mind can help manage the disease better. Expression in as many positive ways as possible: Writing a journal or just talking about it to any trustworthy person can prevent the negativity from piling on. Following the guidelines of a healthcare expert with a positive approach: All the pointers pertaining to diet, exercises, and also, the advice on the use of support equipment such as wheelchairs should be considered as practical ways of managing the disease.